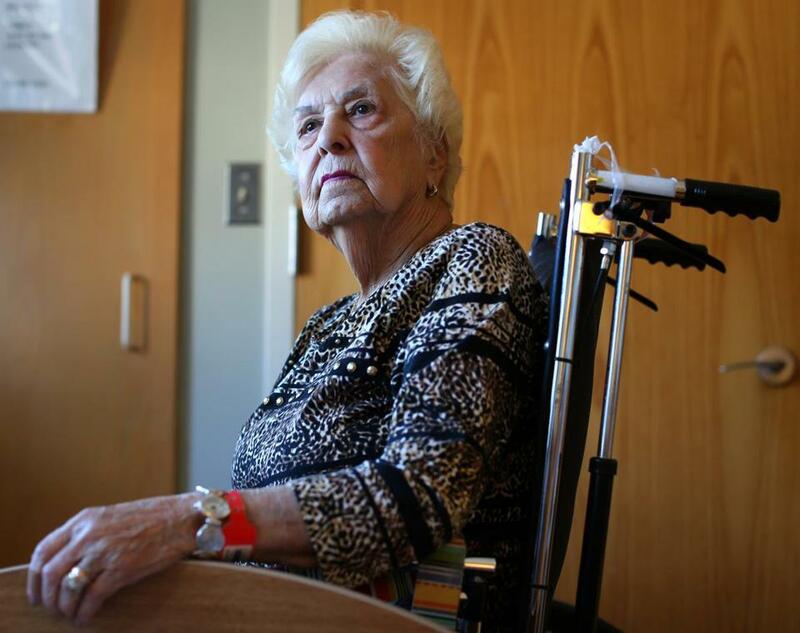 Hebrew Rehabilitation Center resident Pearl Daley was in favor of reducing the amount of alarms. Walk the halls of Hebrew Rehabilitation Center in Roslindale and you’ll be struck by what you don’t hear: the beep, beep, beep of alarms. Typically, care facilities attach alarms to beds and wheelchairs of patients considered at risk of falling. The pressure-sensitive devices have been used since physical restraints were outlawed in the 1990s. But do alarms really keep residents safer? Are they worth the price of leaving them in fear of making the slightest move, interrupting their sleep and that of their roommates, and driving nurses and nursing aides to distraction every time one goes off? The answer is no, say staff at the rehab center, a subsidiary of the elder care provider Hebrew SeniorLife. That is why Hebrew Rehab has virtually eliminated alarms from its rehabilitative and long-term care facilities in Roslindale and at NewBridge on the Charles in Dedham. Previously, 30 percent to 40 percent of the 600 patients had bed alarms, chair alarms, or both. Since fully implementing the program a year ago, Hebrew Rehab has not seen an increase in falls or serious injuries, said Tammy Retalic, chief nursing officer at Hebrew Rehab. And as residents free themselves from the tyranny of alarms, more are walking, eating, and dressing without help. Genriyetta M. Sitnikova is among those freed from alarms. Sitnikova, who had been very independent, wouldn’t get up at night to use the bathroom, worried that the alarm would wake her roommate, said her daughter, Sofia Verbitsky of Stoughton. During the day, she feared making a move in her wheelchair. But after the alarms were removed about 2½ years ago, Sitnikova started to walk with assistance and get more exercise. “She felt much better,” Verbitsky said. Removing alarms is part of an effort by Hebrew SeniorLife and other innovative caregivers to change the culture of nursing homes. Nationwide, it has been spearheaded by the Pioneer Network, a consortium of geriatric professionals that since 1997 has promoted greater autonomy and more personalized care for seniors. “If anything, the alarms gave staff a false sense of security,” said Lynda Crandall, executive director of the Pioneer Network and a gerontological nurse practitioner in Oregon. What followed were a series of meetings between administrators and frontline staff about alternative safety nets, as well as discussions with patients and their families. The use of alarms had become such an ingrained practice that some nurses initially balked at the change. Instead of just poking their heads in a room to make sure patients were OK, nurses and nursing assistants would pose a series of questions: “Would you like to go to the bathroom? Would you like a drink? Do you feel comfortable? Do you have any pain?” They would also inspect the room for potential safety hazards and announce when they would next visit. As a result, the nursing staff became more proactive, addressing patients’ needs before they would try to get up on their own. The staff found that even patients with serious dementia displayed patterns. One might always want a glass of milk at 2 a.m. Another might need to use the bathroom an hour after lunch. Based on their observations, the nursing staff refined care plans. “If somebody has a very high risk of falling, we monitor them very often,” said Kogan. At shift changes, nurses and aides would meet briefly to discuss changes in patients’ emotional and physical health. After the pilot program proved itself over five months, Hebrew Rehab phased in purposeful rounding throughout its facilities. Just a few patients still have alarms — at the request of their families. Initially, Hebrew Rehab noted a decline in the fall rate, but it has fluctuated since. The staff says that as patients enter later stages of dementia, they are more prone to fall. After a fall, those involved in caring for the patient meet to discuss what happened. “This huddle creates critical thinking about strategies to prevent falls,” said Karen Drake, who oversees the post-acute unit at Roslindale. For example, a lower bed, additional floor padding, or better lighting might be the solution. While the data isn’t solid, some evidence suggests that removing alarms has decreased the severity of falls. The reason, possibly, is that as people move about, they strengthen muscles, improve agility, and sharpen their reflexes. Interest is growing in removing alarms. Representatives from more than 100 nursing home last summer attended forums on the subject sponsored by Massachusetts Culture Change Coalition, an affiliate of the Pioneer Network. Morris of the Institute for Aging Research is closely watching the Hebrew Rehab program and others like it. He said that he hoped to publish a report later this year on ways to promote greater independence among nursing home residents without increasing fall rates.